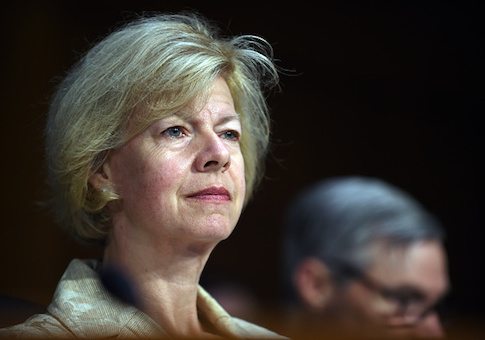 Millions of dollars are flowing into Sen. Tammy Baldwin's (D., Wis.) campaign coffers from outside her home state despite the senator's campaign fundraising off out-of-state money from deep-pocketed Republican donors against her in nearly every one of its fundraising emails. One such email sent from the campaign in early June said that "Republicans want the first openly gay senator out of office" and alluded to Republicans "throwing the kitchen sink" at Baldwin because she is homosexual. "Polls continue to show a very close election here in Wisconsin, and with billionaires like the Koch Brothers and Illinois millionaire Richard Uihlein spending so much money in this race, we cannot afford to sit on the sidelines," the email reads. "I was planning to have us take the day off after our Cheddarbomb earlier this week, but the Koch brothers had a different idea. A ‘powerful conservative group' bankrolled by the Kochs just announced a new series of ads attacking Tammy!" a later fundraising email from the campaign reads. A short email from the campaign sent on Monday again references the Kochs three times. Despite Baldwin's constant fundraising pitches being based on out-of-state money from Republicans, her campaign is being fueled by out of state donors, and she is receiving assistance from outside liberal groups and operatives. Nearly 60 percent of Baldwin's campaign contributions are from outside of Wisconsin, records show. 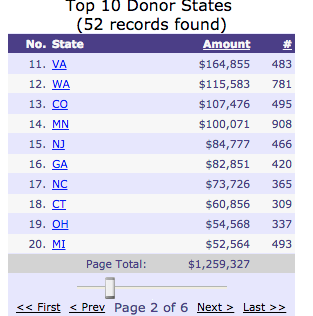 This cycle Baldwin has received $1.24 million in itemized contributions from residents in California; $1.1 million from New York; $514,500 from Illinois; $450,000 from Washington, D.C.; $447,000 from Massachusetts; $340,000 from Texas; $220,000 from Pennsylvania; $200,000 from residents in Maryland and Florida; $165,000 from Virginians; $115,000 from Washington; $107,000 from Colorado; and $100,000 from Minnesota. Residents from the remaining states each added tens of thousands, on average. Residents in Wisconsin have given $3.9 million to Baldwin's campaign as of March 31. The campaign did not return a request for comment on the donations. Leah Vukmir, a registered nurse and state senator who is running in the Republican primary, and who has been endorsed by the Wisconsin Republican Party and Rep. Paul Ryan, has received nearly 70 percent of her contributions from Wisconsinites. Baldwin has also received outside help from the Senate Majority PAC (SMP), a D.C.-based Democratic Super PAC founded by former Harry Reid staffers. The group has spent more than $1 million in independent expenditures in support of Baldwin. 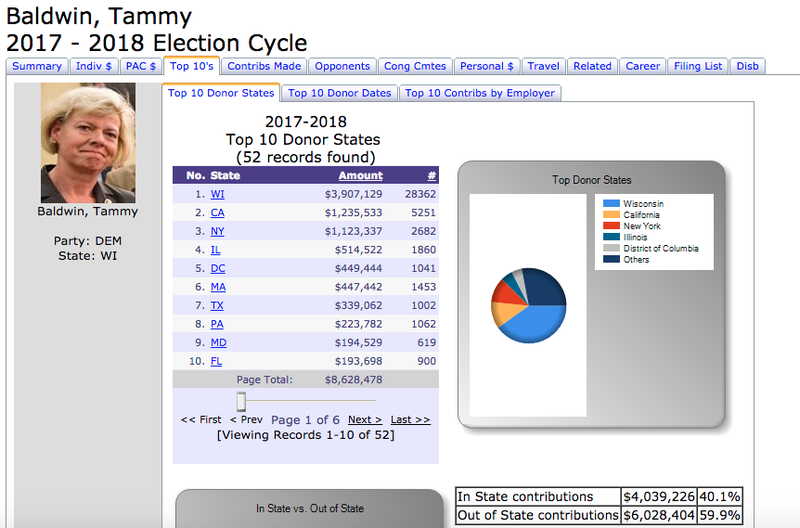 Top donors to SMP this election cycle are Donald Sussman, a hedge-funder who gave $3.5 million, and Alexander Soros, the son of liberal billionaire George Soros, who has donated $2 million to the committee, filings show. George Soros added $1 million. The SMP has shared staff and office space with Majority Forward, a nonprofit 501(c)(4) organization that does not have to disclose its donors. Majority Forward ran ads this cycle defending Baldwin's record on the scandal-plagued Tomah VA alongside VoteVets PAC, a progressive veterans group who has received millions from the SMP this cycle. Baldwin, first elected in 2012, was the only member of Congress from Wisconsin who received an inspector general report detailing the abuses at the Tomah VA facility. Baldwin did not act on the report until nearly four months later after a Marine had been prescribed a deadly amount of drugs and overdosed. Baldwin ultimately brought in Marc Elias, a partner at the D.C.-based Perkins Coie law firm who is considered the "go-to fixer for Democrats in trouble" and who represents a number of Democratic campaigns and PACs, to help after a former staffer was fired and offered a severance package if they were to sign a confidentially agreement, but rejected the offer. As Republicans hit Baldwin's handling of the issue, Majority Forward and Vote Vets then began running ads in Baldwin's defense. Majority Forward was incorporated by Elias in June 2015, the Washington Free Beacon previously reported. Elias's firm was paid $90,000 for its crisis control work that year. Baldwin quietly stepped away from the committee that has oversight of the Tomah VA facility in early 2017. This entry was posted in Politics and tagged 2018 Election, Tammy Baldwin. Bookmark the permalink.